Small (sizes 4-6) - £24.99 Only 7 left! Medium (sizes 8-10) - £24.99 Only 7 left! Large (sizes 12-14) - £24.99 Only 3 left! During the Clone Wars there was only one army that the Jedi called upon to help: The Clone Troopers! Clone troopers were an army of identical, genetically modified clones created to serve in the Grand Army of the Republic. At the time of their introduction, the Republic clone troopers represented the future of galactic warfare. Far superior to battle droids, the clone troopers formed the backbone of the Republic's new military during the full-scale intergalactic conflict against the forces of the Confederacy of Independent Systems. So symbolic were they of the times, this galaxy-wide conflict that saw their debut took its name from their ranks: the Clone Wars! Trained since they were tiny little guys in test tubes to become the greatest warriors they can be, these soldiers were grown at an accelerated rate and raised in the laboratories and facilities of Kamino, the clone troopers are trained throughout the first ten years of their lives to become one of the most efficient military forces in galactic history. 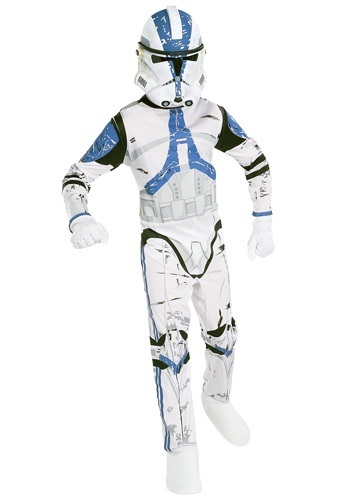 And now your little one can also take part in this prestigious training and prepare to fight in one of the greatest battles in all the galaxy with this Star Wars Clone Trooper costume! 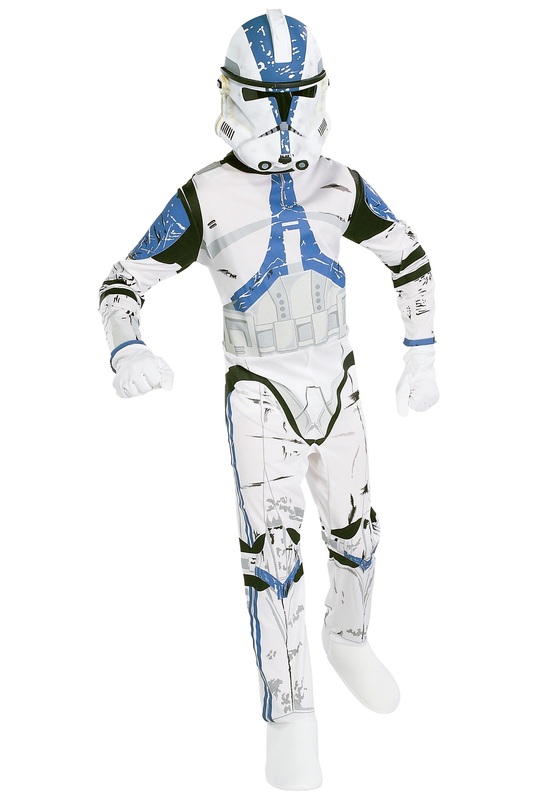 Straight from the Star Wars Episode 3 movie, this Clone Trooper jumpsuit - complete with boot covers and a helmet half mask - will make your best little buddy feel battle ready and let their imagination shoot straight into another galaxy! An army of one man, but the right army for the job!